All of my complaints about our cool summer weather must have been heard, because—as I mentioned in my Danish braid post for the Daring Bakers—the heat caught up with us last weekend. And what better way to celebrate the start of the summer weather than by making fish soup? Well, maybe hot soup and hot weather don’t go so well together, but at least these two meals were light on fat and prep time, and didn’t require the use of the oven. The first version I tried out owes another little nod to Emeril, who introduced me to the idea of fish cooked in court bouillon a few weeks back. (Court bouillon—seemingly pronounced coo be-yone—is a light vegetable broth usually containing a mirepoix and an acid element, like white wine or lemon juice.) I chose a recipe from Epicurious and made the broth during one of Nolan’s naps, using my last half-onion and some use-it-or-lose-it leeks. It percolated on low heat until Jeremy was ready for dinner, at which point I dropped in my chunks of wild halibut fillet. Nolan chose this moment to wake up screaming, of course, so I ended up eating my dinner at top speed while trying vainly not to burn my tongue. I may not have been able to give it a fair shake, but the flavors were really too subtle for me (read: bland) and I ended up adding quite a good pinch of salt to my plate to make it more palatable. Jeremy seemed to like it, mostly on the above-stated grounds of lightness. The next night, after watching an oddly serendipitous episode of Good Eats that featured fish poached in court bouillon, I decided to transform our leftover halibut and broth into a simple chowder. Using a slotted spoon, I removed the fish and most of the vegetables from the broth, the latter going in a saucepan to simmer with two small cubed potatoes. When the potato was tender, I again employed the slotted spoon to rescue some of the potatoes for texture before pureeing the soup with my hand blender. The reserved potatoes, veggies and halibut (broken into bite-sized chunks) went back into this thickened soup base to warm through, along with a sprinkle of Old Bay seasoning. We ended up with a completely different soup than what we started with—hearty but very light, and still virtually fat-free. And just to round out that whole Food Network/halibut soup thread, the episode of The Middleman I put on over dinner turned out to feature none other than the Chairman from Iron Chef America! For court bouillon: In a 4- to 6-quart heavy saucepan bring wine and water to a boil with onion, carrot, leek, spices and salt and simmer 20 minutes. Add oil and halibut and poach fish at a bare simmer, covered, until just cooked through, 5 to 6 minutes. Place some rice into shallow bowls; transfer fish with a slotted spoon onto rice, and spoon court bouillon over fish. Sprinkle fish with fresh coriander and garnish with lemon wedges, if desired. 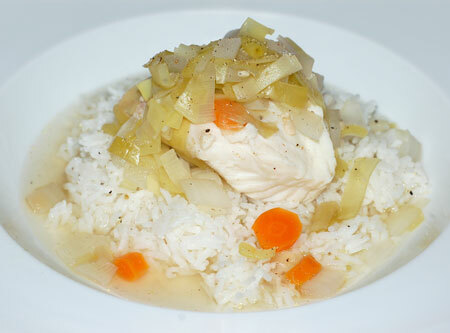 For chowder: From leftover court bouillon, strain the fish and most of the vegetables out of the liquid, and reserve in a bowl. Place the broth and remaining vegetables over medium heat in a saucepan. Add the potatoes and simmer until they are cooked, then remove half of them to the bowl with the fish. 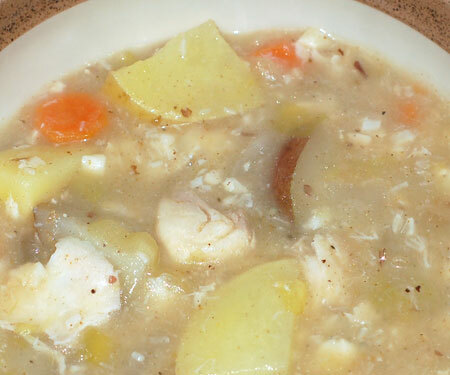 Use a stick blender to puree the potatoes, broth and vegetables in the saucepan, then return to the heat and add the reserved potatoes, veggies and halibut (flake the latter into bite-sized chunks) to warm through. Season to taste, with Old Bay if desired.